Welcome to our church. We hope you will enjoy exploring our website. For further information about what we do here, please contact the Vicar, the Rev'd Gillean Craig, or our Parish Administrator, Mrs Susan Russell. Morning and Evening Prayer are said by the clergy in church every day who are always glad when anyone joins them. We also have a daily celebration of the Holy Eucharist. Please click here for details about times, which vary with the calendar. The St Mary Abbots fundraising appeal is now well and truly underway, with our dedicated website now online. Please do have a look at what we are trying to achieve. RAISING THE ROOF - THE WORK BEGINS AT LAST! 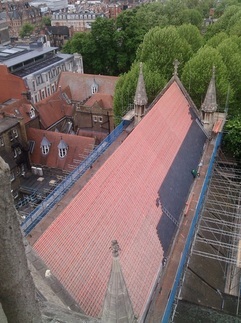 Just before Easter, the scaffolders completed their structure and work was handed over to the stoneworkers who will be removing the old slates and replacing them with new ones. We anticipate the whole thing to be complete by the end of November, but during this time there will, of necessity, be various disruptions to access to and around the church. Inside the church many of our items of furniture have been shrouded in polythene, to protect them from the grit and dust that will be swirling around in the air, as a result of the work on the roof. This will mean temporary arrangements over the next months, with the High Altar out of action, etc. Every day visitors from all over the world visit St Mary Abbots. Our team of church watchers extends them a warm welcome. At St Mary Abbots it’s our privilege to keeping our church open every day of the year, an extraordinary resource valued by so many who come in to pray, to give thanks, to find help in despair. But this is only possible thanks to our team of CHURCHWATCHERS. We now have serious gaps in this provision and we are eager to find people who will commit to a couple of hours once a week, once a fortnight, once a month. Contact the Virger George MacAllan 020 7937 5136 or the Vicar, Fr Gillean, 7937 6032 – we’re always looking for new volunteers.